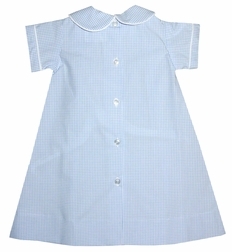 A sweet simple light blue gingham day gown for baby boys by. The gown is made with a Peter Pan collar which, along with the sleeves, is piped in white. The gown buttons in the back. 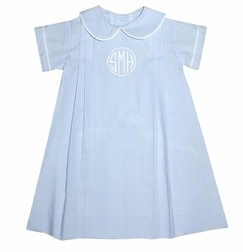 It is adorable monogrammed and perfect for hospital, new baby pictures and bringing baby home.